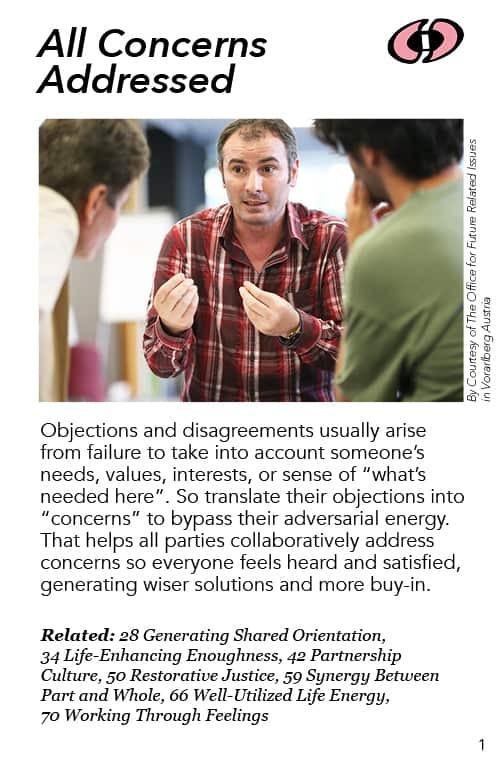 Objections and disagreements usually arise from failure to take into account someone’s needs, values, interests, or sense of “what’s needed here”. So translate their objections into “concerns” to bypass their adversarial energy. That helps all parties collaboratively address concerns so everyone feels heard and satisfied, generating wiser solutions and more buy-in. There are many different methods that tap needs or values or interests. Some additional material on this is covered in the “Grounding in Fundamental Needs” pattern. But “concerns” have a fascinating relationship to all of these phenomena. The fact that someone has a concern means that – for them – there’s something potentially very wrong going on. That is why they have a “concern” – they are concerned about something happening that they don’t like. The energy of concern is not that something is absolutely wrong. Rather, it’s potentially wrong. It is something that rises up in them, a warning kind of energy. It rises up because of some violation of needs, values, interests, some violation of what’s needed here in regard to what the situation requires. The life energy contained in a concern covers so much ground, so many things that you could detail out. You can of course clarify what everybody’s needs are ahead of time, or you can simply respond to their concerns as your conversation is going on. When people have objections or disagreements, you recognize that as a response that has something important in it, something we need to consider in order to be more wise or to engage more people. The objection or disagreement is a pulling away. If I’m pulling away from you, then I’m saying what you’re doing is full of crap and I’m not going to go along with it. That splits up the group and breaks up the collective mind. Translating that antagonism and withdrawal as a concern involves simply saying something like, “Oh, ok, what’s your concern?” Then the person has to go into their internal response – into that felt sense of concern – and say what it is that’s going on that makes them so concerned. That brings that information up into the group consciousness for everyone to consider. This approach releases adversarial energy, objection, disagreements – that adverserial, clashy, pulling apart kind of energy – and goes: “OK, let’s attend to this together and collaboratively address it“. If you can satisfy a concern – whatever its source – even if you just take it seriously and address it seriously – that makes the person with the concern feel heard. Even if their concern is not satisfied, if it is just addressed really well, if people take it seriously – there’s a deep shift that takes place. There is something about people psychologically identifying themselves with their concerns. Their concerns are part of who they legitimately think themselves to be – they see themselves as concerned because something good needs to happen and it isn’t going to happen unless their concern is taken care of. They are thinking of themselves as a good person and trying to speak for something that is trying to be good. All that psychological intensity is bound up with their concern. Part of the power of all this is that a concern is fundamentally about caring. If you are concerned, you care. And if you have a concern about something it is because you care about the thing that the concern is attached to. So one of the most powerful things about concern – the term and the concept of concern and it’s role in generating wisdom – is that it is fundamentally about what people care about. That caring is a source of insight and collaborative power – if you can tap it. So when someone’s concern is really heard by the group, there is tremendous validation and resurgence of life energy and renewed willingness to be absorbed into and move with the energy of the group. Each concern that somebody has is a piece of something that needs to be taken into account in order to have longterm broad benefit. It is a piece of the puzzle. So both from an informational perspective and a psychological perspective this is a really important phenomenon. From my work so far in the last 20-30 years I’ve concluded that concerns hold a truly vital key. If we can focus on that, we’ll make progress. Unfortunately, I don’t know how it is in other languages, if they have a comparable word or concept. In English the word “concern“ and its usage – as described above – offers powerful leverage that covers a lot of ground. That is what I would say both in terms of the wisdom of the decision – how well we include different factors that need to be taken into account – AND the mustering of support for actually getting the decision implemented. If you really address concerns well, you will have better collaboration to implement a decision that is pretty wise to begin with. The facilitator immediately moved right up to me and said, with remarkable interest: “What is your concern? Give it to me“ – motioning with her hand, with a “give it to me” gesture. As I turned around to tell her what my concern was, I was very aware – watching myself and the guy and the facilitator in this interaction and process – that what she was doing was a brilliant Aikido move. All the energy I used to put this guy down instantly evaporated and she was simply gathering information that I had and that the group needed. Everybody was safe and the conversation flowed onward. Woo! I was blown away. I realized instantly that that way of handling things is incredibly potent. I began to notice that phenomenon elsewhere. I noted its use in a simple consensus question that makes it unnecessary to vote. It is like the opposite of voting, the inside out of voting. Instead of unanimous voting, you arrive at the simple fact of unity. It goes like this: After much discussion the facilitator may notice that there seems to be a shared solution showing up. She will say something like, “It seems there’s some agreement emerging that we should handle the situation like X . . . . Does anybody have any concerns about that?“ This is not a rhetorical question. The facilitator is actually actively soliciting concerns, any concerns at all. If nobody has any concerns, then the group knows what its solution is. If there are concerns, they are addressed until there aren’t any more. This is such a beautiful and very smooth kind of move – and it doesn’t involve voting. So I think of Dynamic Facilitation and that kind of Consensus Process as particularly potent, using the same basic tool. I also have proposal for a deliberative online game that is designed for diverse people who form into online teams. 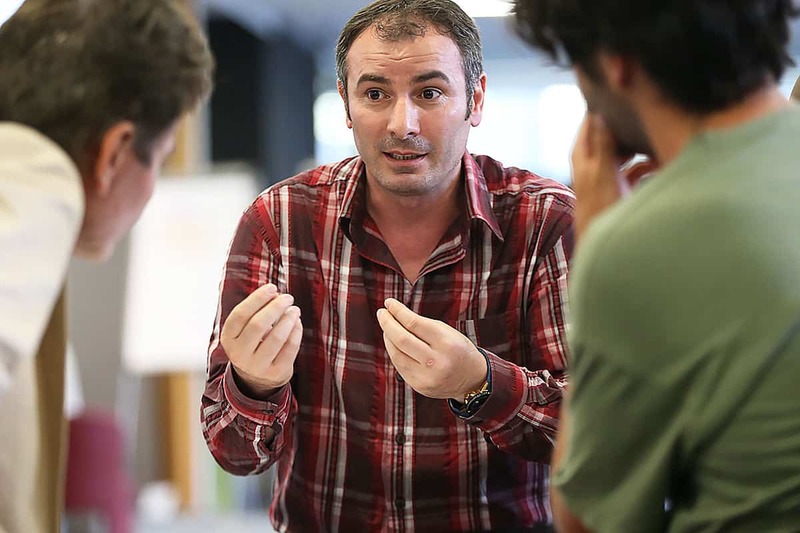 The members generate proposals to address an issue and then generate concerns about each other’s proposals and then work together to satisfy those concerns. The most diverse teams who come up with the most agreed-on proposals get the most points in the game. This hasn’t been tested yet, but I think it could be a powerful form of leverage to address concerns explicitly and show how diverse people could work together. It just might also generate solutions to social problems that people might want to organize around and actually get adopted in the real world!